The Soviet battle cruiser Simbirsk, which launched in June 1940 and was reported sunk in 1944 with the loss of all hands, is still sailing the open sea. January of 2017: American Los Angeles class submarine U.S.S. Houston is tracking a surface target that is not listed as part of the Russian navy’s response to the NATO maneuvers. What they find will set in motion the answers to one of the great mysteries of World War II. With the Russian navy bearing down on the Houston and international tensions running high, the United States Navy declares the Soviet-era derelict legal salvage under international law. With the world’s most powerful navies going toe-to-toe in the North Atlantic, the President of the United States calls upon the one organization that has a chance to figure out why this ship is in this time, in this place—Department 5656, also known as the Event Group. When the Group arrives, they are confronted by three warships of the Russian Navy who have come to claim Russian property. The two groups meet and soon discover that the ancient battle cruiser is not a derelict at all, but fully functional with a mysterious apparatus that sent the original crew to their deaths. In the midst of their warfare in the tossing seas, both navies are sent into a realm of unimaginable terror—an alternate world of water, ice, and death. 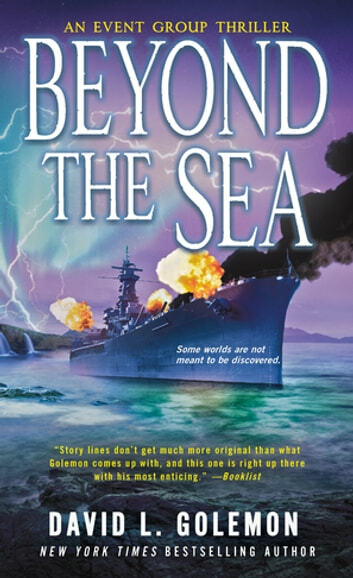 The Event Group has a new mission when relics of the fabled Philadelphia Experiment surface in Beyond the Sea, the twelfth thrilling hit in New York Times bestselling author David L. Golemon's Event Group series. Excellent, action, moral. A good read. Love the characters. Once again a riveting tale combining historical facts with modern political interests. I'm happy that the series will be more frequent and at a lower price point. This latest chapter of the Event Group Team kept me glued to my pages. As always David Golemon delivered a fast paced and exciting story. My only complaint is that I am sad I have read the last page. Hopefully there will be an Event Group #13 soon in the future. Just grab hold of it. This is as good as it gets. The suspense & drama in this book is killing me with every page I turn. I was surprised after a few chapters that I would enjoy this book. I was more interested by the topic than the Spy side of it. But in the end it won me over. I will definitely be looking other books by this author.